A craze that is raging across France, apparently, is the philosophy teatime for kids. Yes, I find it difficult to believe too. Make that 'impossible' if I consider my two philistines. 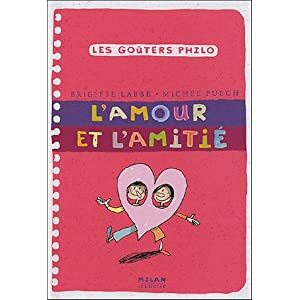 And yet, the collection Les Goûters Philo are selling like hotcakes to the tune of 900K examples in France, and have been translated into 12 languages. So it can't be just a bunch of bobo Parisians buying it. The Times gives a good write-up of it here, but basically it's a series of 20 titles which present philosophical themes: Justice/injustice, Success/failure, Violence/non-violence, and so on. Actually, it sounds really interesting and I might just buy a bunch of 3 as an experiment. The idea of the philosophy teatime is to sit the kids round with cakes and fruit juice, they vote on a topic to discuss, then hammer it out for an hour. I'm still reeling at the prospect actually which probably implies that I'm a bad mother who's severely underestimating her little darlings and their potential to discuss the Big Questions, but frankly, I Just Can't See It. Maybe it would work if I suggested we have family philo discussions over dinner... (I'm laughing as I write this). They could read the book over the week and then we could have a nice dinner and discuss War & Peace or Rights & Duties, Good & Evil or even Pride & Shame. It would set them up nicely to join those cafés philosophique later (I'm still laughing) which are so popular here. You know, just to annoy them, I might just buy a set of three. Which would you go for? My TWDB and I were wanting to go to a café philosophique just to get out and do something different. We've been talking about it for, oooh, a year, and still haven't made it. Maybe we could just set it up at home, with the kids and their friends! Am tempted to buy a book or two for myself! I think when I was young this idea would have had me running for the hills. Now of course it is very appealing. Nick's right - it is *very* French. "Les droits et les devoirs"
Some good thinking for my ado son there. FF - I think the idea of philosophy improves with age. Perhaps a bit of practical application...like what exactly was going on with Rwanda...might develop the theme. Just try them on #4 and #5 alone! #6 if you want three, but 4&5 seem interrelated somehow! The books have arrived and look really cool. They are even hardbacks! Keen to get my eldest reading them, if I have to chain him to the bannisters with just enough arm length to turn the pages. He sooo needs to do some thinking right now!! !